At a school replete with both visible and invisible social structures, Usdan breakfast stands in solidarity with its weekly nighttime counterpart Keg Co-op as a temporary space in which the hierarchy dissipates. 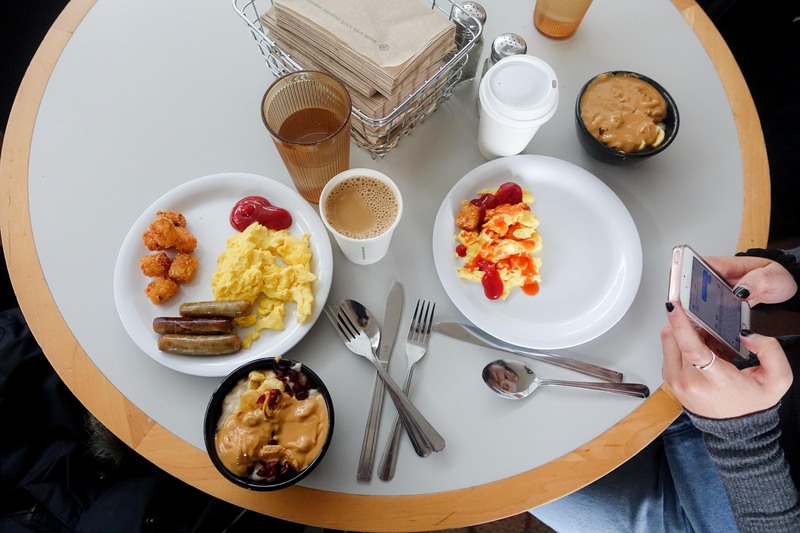 The main difference between the two is that every Thursday eve, Keg Co-op draws in the partiers of each friend group, while every weekday morning, Usdan breakfast attracts the worm-getters of campus life—the early birds, if you will. With this in mind, The Argus decided to investigate the social undertones of Usdan breakfast, to pinpoint what it is that keeps bringing back such a diverse, eclectic crowd. Hoping to gain some insight into the student perspective, The Argus stumbled upon breakfast regular Andrew Dalton ’20. Riding solo with a plate adorned with scrambled eggs, sausage, pancakes, and cantaloupe, it took a few minutes for the groggy Dalton to open up to us about the meaning behind this daily ritual of his. Looking around at the numerous individuals scattered amongst the side deemed “loud” during lunch, dinner and weekend brunches, Dalton’s reasoning for opting to eat alone seemed to be reflected in his peers’ seating patterns. The side of Usdan that is otherwise loud during the later hours of the day was then filled with more subdued sounds. There’s the occasional chatter from groups of friends, but about a solid half of the students there eat at a table for one, eyes glued to laptops, and books open. It almost has the feel of a more chatty, casual section of Olin Library. Dalton delved deeper into this assessment of his fellow dayspring wayfarers of the Usdan marketplace, analyzing what it is that keeps the regulars coming. Finally, Dalton—a loyalist of neither the quiet nor loud side coteries of Usdan—placed himself in one of the many niches of Cardinals who attend breakfast. On another hazy mid-February forenoon, The Argus approached a school of first years, floundering about in their morning meal revelry. These self-described regulars and quiet-side stalwarts discussed the true meaning of breakfast, whilst wiping the sleepies fromst their eyes. “It’s like what I know, but it’s mirrored,”quiet-side loyalist Peyton Millet said. Bon Appetit Resident District Manager Michael Strumpf, who’s worked for the company since 2000 and on campus for the past ten years, offered comment on the people behind the various stations, who make this hidden gem of a meal happen. During the morning shift, outside of the numerous main kitchen workers in the basement, a utility person works the dishwasher, a cafe attendant wipes tables, a beverage stocker manages the coffee and drink machines, a line server takes orders by classics, and a grill cook serves up the various orders that come and go during the daybreak hustle and bustle. Together, they create the base of the magic that is Usdan breakfast. While Bon Appetit strives to implement sustainable practices and maintain a level of autonomy for their chefs, Strumpf stressed the integral part these tireless workers play in cooking up dishes and maintaining the marketplace mission. Usdan breakfast is open Monday through Friday from 7:30 a.m. (for the early birds among us) to 10:30 a.m. It offers a series of delectable options and easter egg-type deals. For instance, if you can manage rolling from your slumber and into the marketplace before 10 a.m., you can order eggs any which way you’d like from line cook Missy, who passes orders on to grill cook Jen. “Jen is a darling,” Millet agreed toward the end of the interview. If you’re not one to rise at the crack, not to worry. Oatmeal, pancakes, peanut butter and jelly, scrambled eggs, bacon, waffles, cereal, coffee, and assorted fruit await in abundance until 10:30 a.m.
“Early to bed and early to rise makes a man healthy, wealthy, and wise,” the late Ben Franklin once said. Mr. Franklin might have it right, but you’ll just have to come on down and see for yourself. After all, the truth is in the pudding.